“The two words 'information' and 'communication' are often used interchangeably, but they signify quite different things. Information is giving out; communication is getting through,” Sydney J. Harris, a renowned Anglo-American journalist, asserted half a century ago. In the modern digital world of mass communication, this statement seems more relevant now than ever. How can we cut through the noise to develop a communication strategy that is not only heard, but also understood? This, and other questions, are the focus of an article in the September issue of PME magazine. Alongside other prominent voices, Dennis O’Brien (Lucid Group Co-founder and CEO) writes about the importance of focusing on a desired outcome from the start. The article further identified that the right tools and metrics are crucial to developing effective communication strategies that make a difference. The launch of the Lucid metrics platform (link) demonstrates that this, too, resonates with their ideology to improve patient outcomes measurably through medical communication. 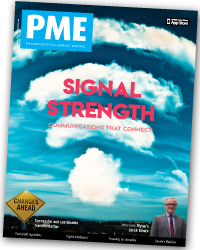 Read the full article here or view the full issue of PME here.